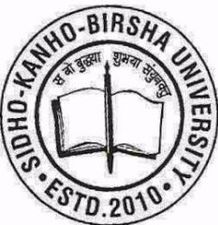 Sidho Kanho Birsha University (SKBU) Recruitment 2019: Sidho Kanho Birsha University has recently publish an advertisement notification for Professor, Associate Professor & Assistant Professor Posts vacancies jobs opening for November 2019. The SKBU notification for the Professor, Associate Professor & Assistant Professor Posts, candidates who are interested may apply in the prescribed application format on or before 12-12-2019. The total vacancies in Sidho Kanho Birsha University (SKBU) Professor, Associate Professor & Assistant Professor post details are given below. SKBU Recruitment 2019 Important Dates. Last Date for Submission of Application: 12-12-2019. The minimum educational qualification for SKBU Recruitment 2019 for the Professor, Associate Professor & Assistant Professor posts is given below. Candidates should possess Ph. D degree in the concerned/ allied/ relevant discipline, Master’s degree in concerned/ allied/ relevant disciplines. (Please check full details in the advertisement).